The case is in pretty good condition overall, and can / will be made much better. I really enjoy refurbishing thes old fibreboard cases; Too often they go ignored and even trashed, when they are quite repairable and a statement of their period. Ones in pristine condition are guitar collectors items even by themselves! ...So why not make a refurbishable one look much and work like it did when it was new ! ? The fibreboard of these cases gets warped and distorted mostly from extended wetness, moisture, humidity, etc. ....and that process is quite easy to reverse with the careful use a steam iron to reform distortions and then dry iron to drive the moisture back out. Because their interior flocking was applied by nominal amounts of hide glue (the old version of modern heat-gun glues), tags and tabs would come unglued over time and are quite easy to reglue back down with modern hide glue that still lends being removeable with heat from a heat gun, or ironing out with the careful use of an iron. ~~~~~~~ Flocking tabs from a donor scrap case will provide protective tabs that should be glued over the abrasive brads that hold the "seatbelt" in; The original flocking tabs have long fallen off. ~~~~~~~ Often a joint or two in the assessory compartment need some shoring up. Here we see some warping and distortion of the fibreboard and wrinkles in the vinyl covering; Probably from spending some time out in the rain .....between gigs on the likes of "bourbon street" ....or "broadway street" where smoky dives exist in many cities ....(giving my imagination some leash here !). In any event spots like these can usually be reformed with careful use of steam and dry irons . ~~~~~~~ I also clean off any live surface corrosion from the hardware, leaving the remaining patina for a customer to decide whether he / she desires it or to polish it shiny again. ~~~~~~~ It's also rather rare to find these old cases with their "seatbelts" still intact. ~~~~~~~ Hinge, and sometimes latches, connecting areas to the fibreboard need some epoxy priming to make them sturdier than the factory did; Although this case's hardware is quite good condition and will lend well to shoring up their connections with the fibreboard. 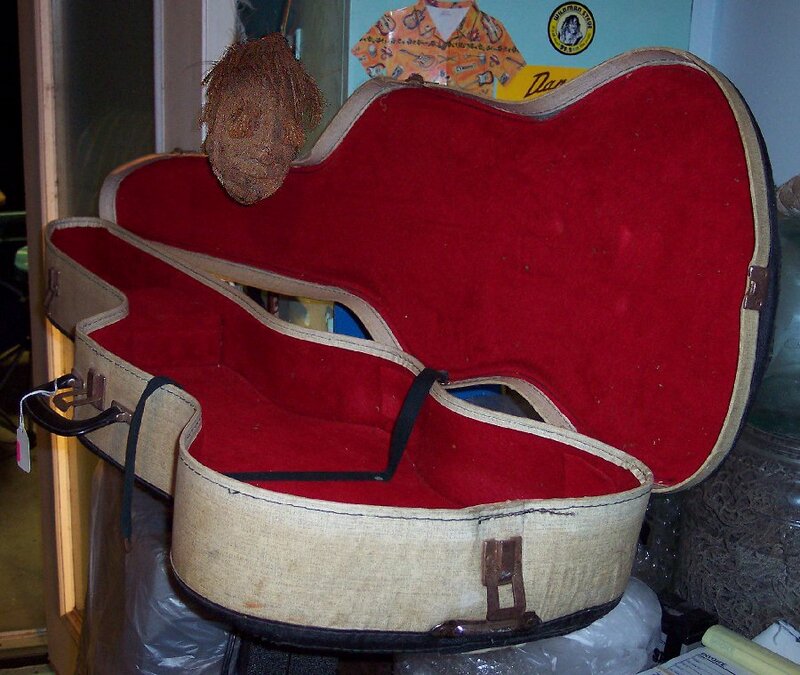 ~~~~~~~ A vacuum-out of the interior and a scrubbing down of the exterior will leave this guitar's Oldsmobile ready to roll. Mr. Coconut Head mojo approves; "Looks like this one will come out quite well ....project approved".